Members occasionally tell us that they find it challenging to get staff to report safety concerns. Safety reporting is in place but not being used as well as it might. 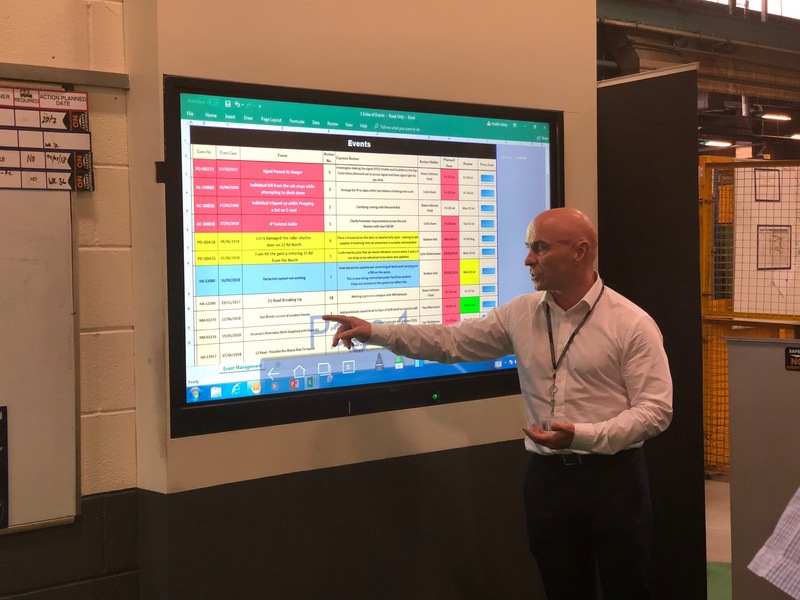 Here, Bombardier UK talks about how their approach to safety reporting is engaging their staff and delivering real safety improvements in their business. Bombardier Transportation has 3,500 employees at over 30 service locations across the UK. As well as designing and building vehicles at Derby, it undertakes heavy maintenance and provides overhaul, asset management and fleet support services for train operating companies. We encourage everyone to identify and report unsafe conditions and provide them with the means to do it through an electronic system which is fully integrated across all our IT platforms. The system records: hazards and near misses; accidents, environmental incidents and property damage; audits and checks; actions; safety meetings and risk assessments. It sends notifications of accidents, hazards and near misses, so issues are identified early on across our whole organisation. How important was senior team buy-in to the system? The senior team recognised that data plays a huge role in developing health and safety strategy. They saw the benefit of a system that enabled employees to report their concerns and managers to have visibility of data and intelligence e.g. track closure rates, meaningful trend analysis. They also saw the need for a strong safety culture to make it successful. In 2004 we undertook a safety culture survey and focus groups to understand what we needed to do, and this led to a series of campaigns to get everyone engaged, the latest being ‘Safety – No Exceptions’. What’s the key to getting staff to use it? We encourage early reporting by stressing that it helps prevent incidents, and we run safety tours to raise awareness of the system. Near-miss and hazard reporting is growing, and our closure rate is over 95%. Reporting hazards is vital – but safety only improves when they are addressed. Two key factors encourage our people to use the system. The first is transparency, and we involve staff throughout the process. They can view entries to see how investigations are progressing and contribute ideas for solutions. Our staff are the experts in what they do, so generally have great suggestions. We make the outputs and progress visible e.g. on white boards or interactive smart screens. Secondly, we visibly use the outputs. The system provides material for our safety forums, which employees get involved in every day. They see the relevance of the data and it encourages them to participate. How do you embed learning from health and safety reports? We use system data to plan our HSE strategy and allocate resources. The data also highlights topics for specific campaigns e.g. housekeeping, hand injuries. Key themes from our data are: LOTO ; Fall Control; Electrical Safety; Internal Traffic; Machinery; Materials Handling. And we have used the data to underpin behavioural safety workshops. Where does CIRAS fit in? While we have an effective internal reporting system and rigorous safety governance, CIRAS provides a complementary and independent route for staff to report safety concerns. The success of CIRAS is not measured by the number of reports but in the reassurance it provides to managers and staff. We have yet to receive a CIRAS report, and we think this is because we have a successful internal reporting system and an open and transparent safety culture – but CIRAS is there should anyone ever need it. What advice would you give a member setting up an internal health and safety reporting system? A reporting system is only a means to an end and relies on a sound safety culture to be effective. It will only help to improve safety if people use it – so decide what you want the system to do and involve your employees, as they are at the heart of everything you do. Look Out Tag Out – process for ensuring people are protected from stored energy. Internal reporting is important. In my company I had no idea how to report concerns and get a response at the appropriate level. So I reported to CIRAS even though I was not concerned about confidentiality.